Just two Malaysian meeting at Stranger’s Reunion, one of the popular coffee places in Singapore. I was eager to try out coffee places in Singapore as always, this time I made a visit to Stranger’s Reunion as @imnormgoh recommended. I was told Stranger’s Reunion barista had won 3 consecutive times in the ASEAN Barista Champion, including it’s latest win for 2013. Great minds think alike I guess, my friend ah Keinn and I ordered Magic (SGD 5.5 / RM 14.07 / USD 4.4) it’s double ristretto plus milk. I’ve got to say it’s good, magical. Full bodied, slight acidity and just leaves you feeling magical after the first sip, indeed a special taste. 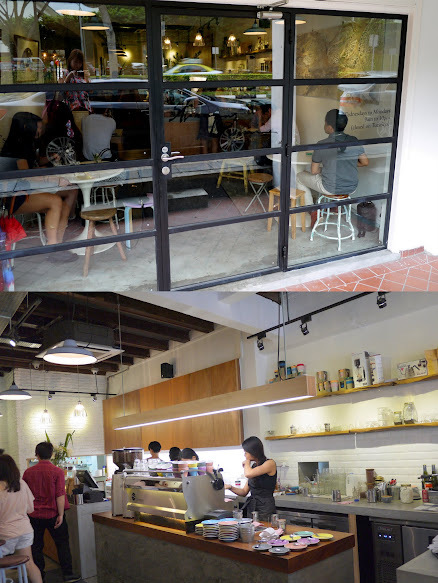 The afternoon crowd on a weekday, full house for this small cafe. Filled with rustic wooden interior with simple deco, Stranger’s Reunion is a cozy place to catch up with friends or enjoy a great cup of coffee. Friend had the Braised lamb shoulder flat bread with Quinoa Tabouli and Hummus (SGD 19.5 / RM 49.90 / USD 15.60), which is available from noon till late as stated on menu. I had Waffles, from the menu it’s called Buttermilk Waffles with Artisan Greek Yogurt and Fresh Fruits (SGD 11.5 / RM 29.43 / USD 9.19). I would recommend this, crispy soft waffles while replacing the usual ice cream toping over with yogurt. Overall, Stranger’s Reunion is a great place to meet up, meet strangers or enjoy a date over great coffee. It’s the perfect brunch place to catch up with girlfriends on a weekend too!